DJI has recently added a new drone to its already strong line-up, this time offering something to beginner pilots. The Phantom 3 SE is an improved and slightly more expensive version of the Phantom 3 Standard. It’s now available for $600, while the Standard sells for around $500. In this review, we compare the two drones with each other and examine how the Phantom 3 SE holds up on its own when put to the test. The DJI Phantom 3 SE offers three major improvements compared to the Phantom 3 Standard. First, it has the maximum transmission range of 4 km, which is 3 km more than the Phantom 3 Standard. Second, it features a downward Vision System that helps the drone hover precisely in place without GPS. Third, it comes with an improved camera capable of recording video in the 4K resolution at 30 frames per second. The last improvement mentioned is also the most important because it puts the Phantom 3 SE into the popular category of 4K-capable drones that cost less than $1,000, alongside the DJI Phantom 4, the DJI Mavic Pro, the Yuneec Q500, or the Autel Robotics X-Star Premium. If you carefully study Phantom 3 SE’s competition, you may notice that only the DJI Phantom 4 and the DJI Mavic Pro offer transmission ranges that exceed the maximum transmission range of the SE. The Phantom 4 uses the Lightbridge transmission system, while the Mavic Pro uses the new OcuSync transmission system. The Phantom 3 SE, on the other hand, transmits over Wi-Fi, so how could DJI achieve such a long range? By significantly increasing the drone’s Wi-Fi power output. This is also the reason why you hardly see the drone in Europe and other countries with strict Wi-Fi output power limits. As stated on DJI’s website, the maximum transmission range would have to be limited to only 500 meters for the drone to be CE-compliant. Apart from the already stated, the Phantom 3 SE offers up to 25 minutes of flight, speeds up to 57 kph (35 mph), and several flight modes, such as Point of Interest, Course Lock, Automatic Hover, and Automatic Return, that are meant to help pilots who are just learning how drones work capture stunning shots and then safely return to home. 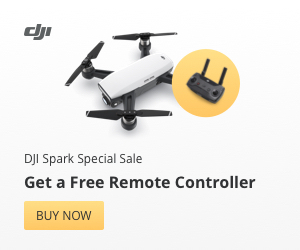 The ergonomic remote controller has remained identical to the one that comes with the Phantom 3 Standard, offering ergonomic control sticks for maximum accuracy and a dedicated dial to adjust the tilt of the camera. We have no doubts that for most beginner pilots, the 4K camera will be the star of the show and perhaps even the main reason why spend the extra $100 or so on the Phantom 3 SE over the Phantom 3 Standard. The camera is stabilized by a 3-axis gimbal that reduces shake and rolling shutter effect. The gimbal works wonderfully well even during some of the worst conditions one would still deem acceptable for flying. The camera itself has a custom-engineered fixed-focus lens with a 94-degree field of view for dramatic wide-angle shots. Besides recording 4K video at 30 frames per second, the camera can also take 12 MP still images in either the JPEG lossy file format or the DNG lossless raw image file format. Regardless of the file format, all shots captured by the camera are characterized by vivid colors, uniform sharpness, and pleasant lack of chromatic aberration. The Phantom 3 SE has a slot for a single microSD card up to 64 GB in capacity. To handle the drone’s maximum video recording bitrate of 60 Mbps, the card has to be rated Class 10 or UHS-1. Regarding its flying characteristics, the Phantom 3 SE handles just like the Phantom 3 Standard and a lot like the Phantom 4. The ability to hover steadily close above the ground is reassuring and occasionally comes in handy, but you probably wouldn’t spend $100 just for the Vision System that enables it. We see the DJI Phantom 3 SE as the company’s final attempt to capitalize on the incredibly popular platform and make a good use of the wealth of parts that are probably just lying around in some Chinese warehouse. And that’s great news for everyone who would like to purchase an excellent 4K drone without spending too much money. The Phantom 3 SE is well worth its price, and its performance is consistently excellent. ← Would you take a ride in a pilotless sky taxi?